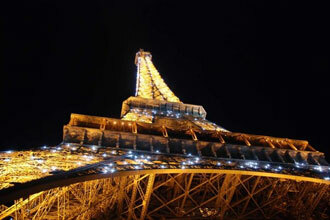 The Eiffel tower is perhaps the best known landmark in Paris and arguably all of France. It was built in 1889 and was at the time the world’s largest tower. It was built by engineer Gustave Eiffel for the Exposition Universelle similar to the Belgians building the Atomimum for Expo ’58. Eiffel originally designed the tower to be built in Barcelona, but the Spanish council decided it was too expensive and did not match the aesthetics of the city. So Eiffel entered his design into the Parison contest for an entrance arch to the Expositon Universelle, part of the design brief was that it had to be easily deconstructed as the structure was only temporary, 20 years. Luckily it became an invaluable communications tower during the Battle of the Marne, so it was decided not to take it down. The official tour Eiffel site has a great pdf of all you need to know. It’s cheap for entry to the tower, the actual cost depends on which floor you visit, obviously the top is the most expensive at â‚¬12,00. The view was amazing at night time, and was definitely worth the 2 hours queuing to get to the top! You have to queue to get the ticket, and queue between floors for the elevators but it was totally worth it. The queue was terrible when I visited a couple of weeks ago. we went up to the 2nd floor by steps. You are too lazy, Alex!!! Looks amazing. Sounds like the steps are the way to go. I came across your site on Wandalust.com – it’s great. I particularly like this post because I spent 5+ months in Paris back in 2001. The Eiffel Tower, of course, was one of the most magnificent landmarks that I had the privilege of visiting. I recently started a travel-related blog with a few friends called “3 Troopin’ Travelers”. If you have a chance, please check it out and send along any feedback you may have. Alex, do you know the details of the tower’s history? I heard that at the beginning people didn’t like it at all, and only when it became the symble of the whole country, the tower got its recognition. Is it true? I just found your site at the top of a google search, and am very impressed i have to say. I’ve done a small amount of travelling, and have just arrived home from a tour of Europe, Paris being one of my destinations. I am attempting to create a website of my travel journal, and this site is massive inspiration, thank you. For me, Paris was incredible, from the numerous sites to the crazy roads, but i didn’t take the hike up the Eiffel Tower regrettably. I was only in Paris for a day or two but spent a lot of time walking the rest of the city, and couldn’t gather the energy to climb the tower. Im looking forward to reading the rest of your posts. thank you Alex since i’m going to Paris this summer i will make sure that i go to the Eiffel Tower!